It may be hard to believe, but the first day of school is just around the corner! It’s time to pick out new lunchboxes, get one more haircut, and choose a perfect first-day of school outfit. Perhaps you treat your child to a special breakfast, place notes in her lunchbox, or take a Pinterest-worthy photo before he hops on the school bus. Kids (and parents) around the world get excited about the first day of school and different cultures celebrate in fun and unique ways. In Germany and Austria, children receive a schuletuete (pronounced shool-too-teh) or “school bag.” But, there is a twist. 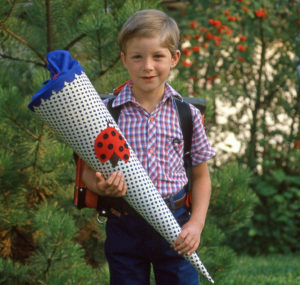 Schuletuetes are actually cone-shaped packages filled with school supplies, small toys, and scrumptious sweets. These special bags may be purchased at a store but, most of the time, parents make them at home. And, sometimes, a shuletuete is as big as the child! In Japan, children bring a lunch of rice with seaweed sauce and quail eggs, thought to bring good luck throughout the school year. In Russia, the first day of school (September 1) is called the “Day of Knowledge” and children give colorful, fresh flowers to their teachers and receive balloons in return. In Italy, kids wear a new “work smock” or grembiule over their clothes. Younger children wear blue-and-white checked smocks (boys) or pink-and-red checked smocks (girls). Once students reach first grade, all smocks are the same blue color. However, they can be personalized for each child. In India, Praveshanotsavam, or “Admission Day” signals the beginning of the new school year and gifts are swapped in celebration. As the Indian school year begins during monsoon season, a common gift is an umbrella. In Holland, children arrive at school sitting in a large box attached to a bakfiesen, or cargo bike. This eco-friendly mode of transportation is a favorite way to transport children to and from school as well as other activities. What special first day of school traditions do you share with your family?